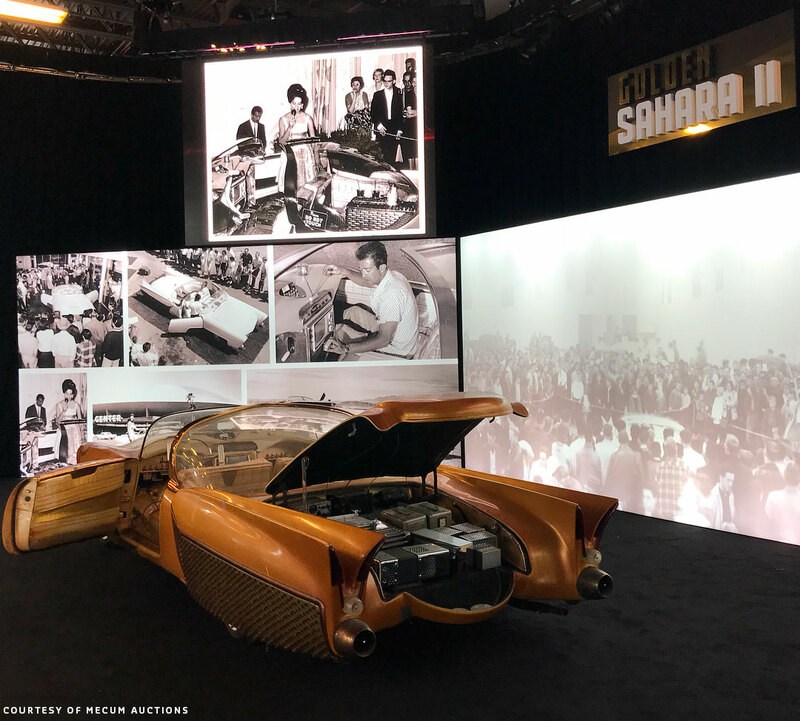 Nearly 50 years after the Golden Sahara’s disappearance from the public the Car was unveiled to the Public on May 14, 2018. 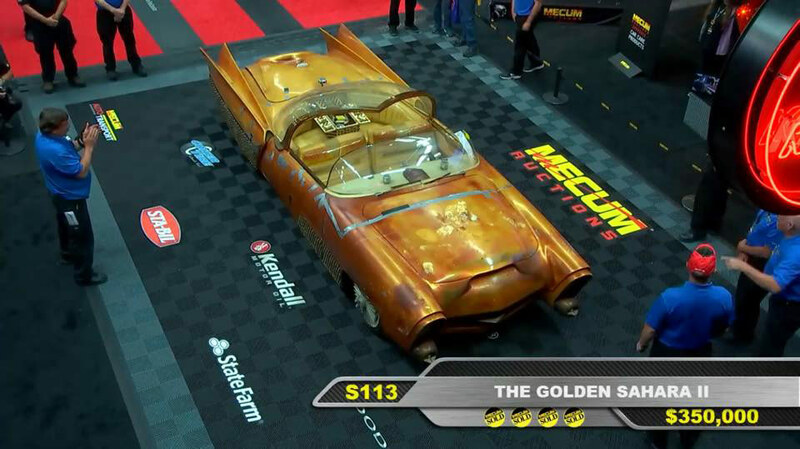 The Golden Sahara sold for $350,000. 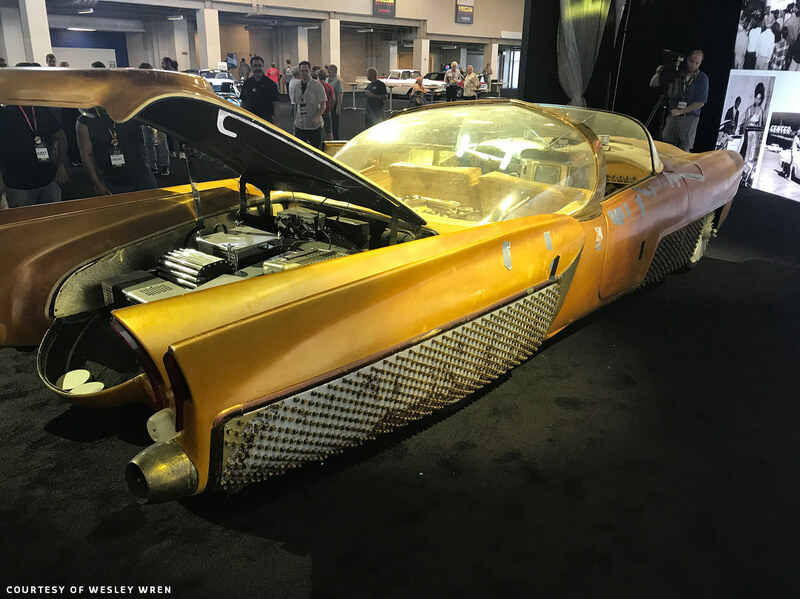 After Jim Street had passed away in November 2017 it as decided to auction off most of his car, boat and bike collection. 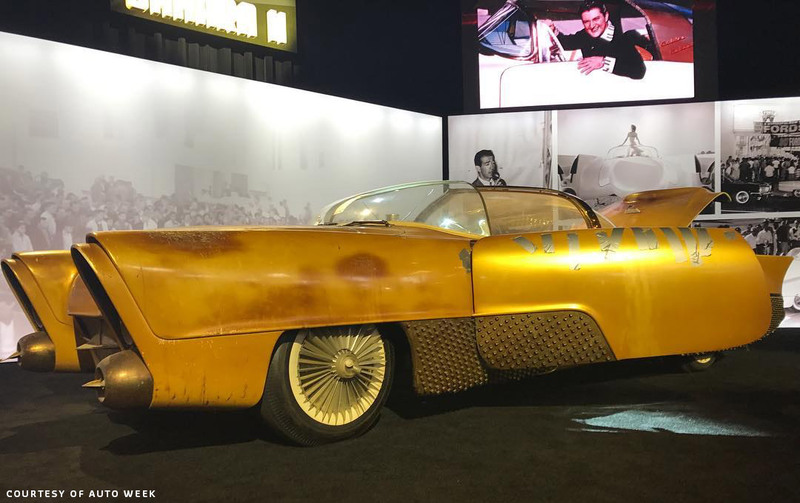 The Dana Mecum’s 31st Original Spring Classic Auction in Indianapolis would be the event where the Jim Street Estate Collection will be auctioned. 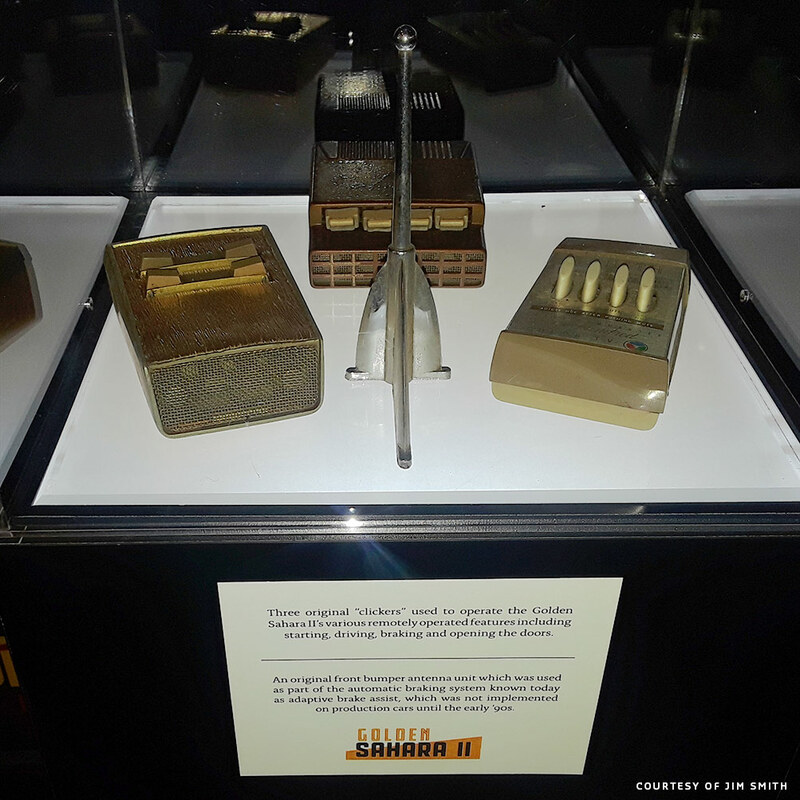 The Golden Sahara is the highlight of the collection. and a lot of attention has been paid to create as much buzz as possible around the Golden Sahara. 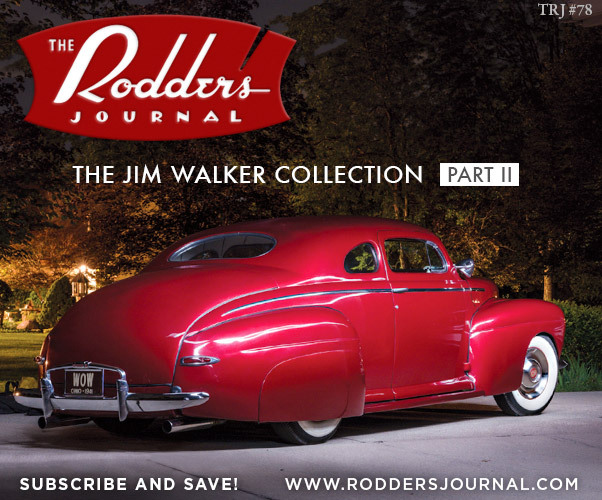 As much buzz perhaps as what the car created in its show time from 1954 till the late 1960’s. 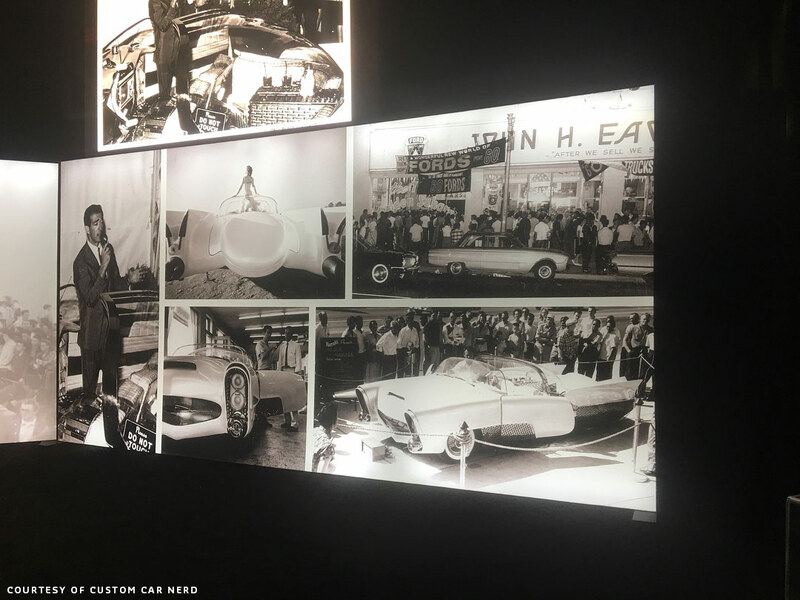 For the first time in decades, the Custom Car Icon will be available for public viewing just as how it had been found in Jim Street’s Garage. 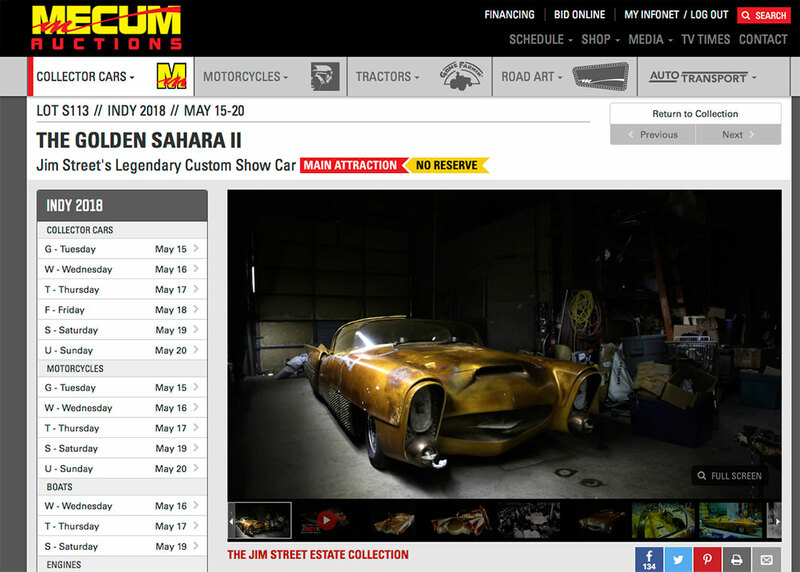 The Golden Sahara as advertised on the Mucum Auctions site. Main Atraction with No Reserve. 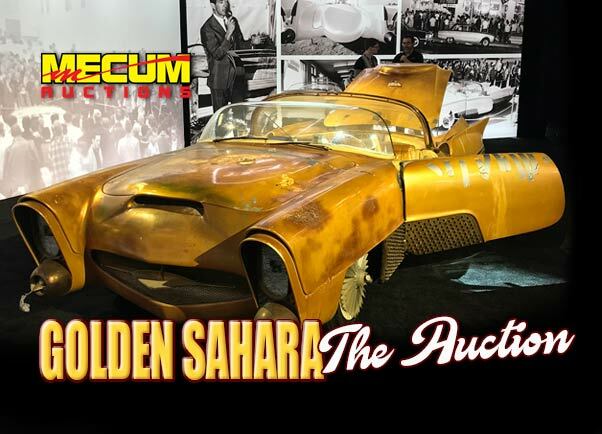 On Saturday May 19, 2018 at around 2 PM (14:00) EST the Golden Sahara will be taking place at the Auction hall, and the bidding will start. 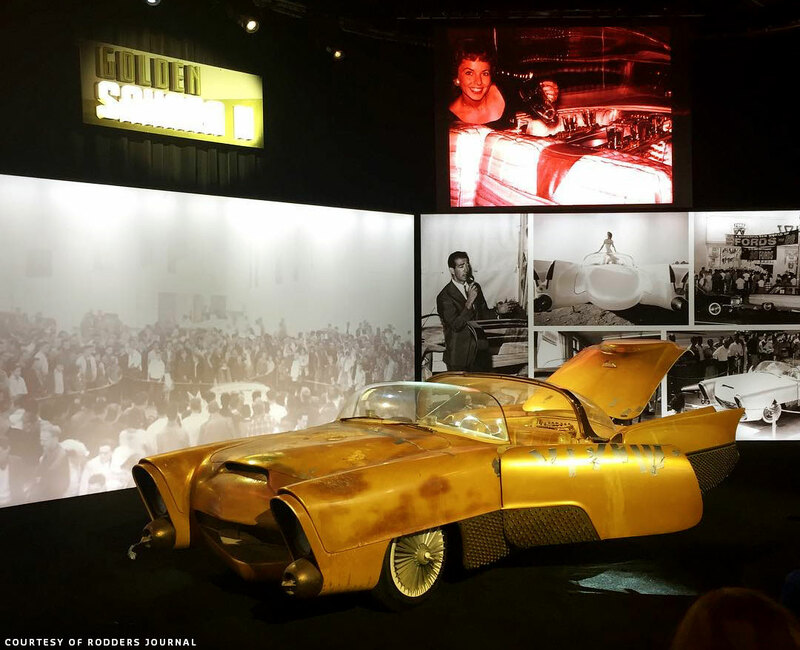 The Internet has been buzzing for week already about how much the Golden Sahara (and the Kookie Kar) will sell for. 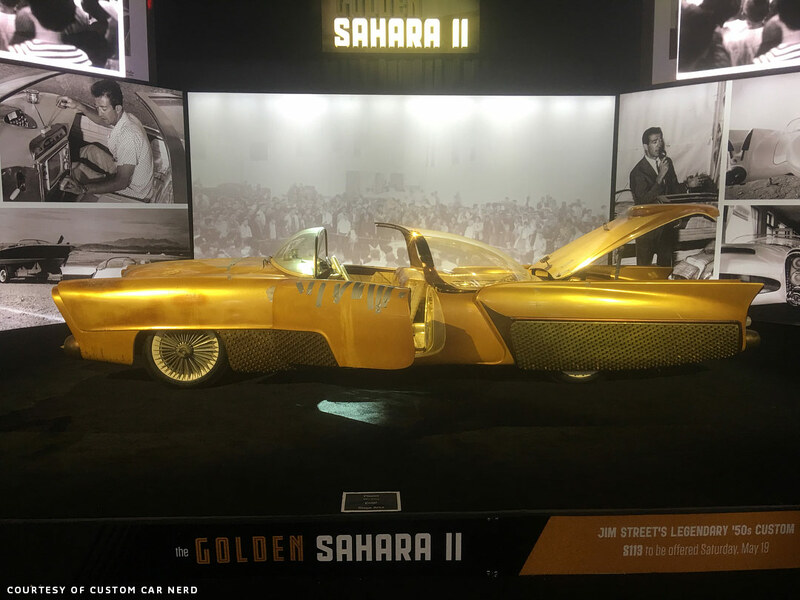 We know that there are several very serious possible buyers who want to have the Unique Golden Sahara in their Collection. What it will be sold for we have to wait till the auction has ended in a little over a day. 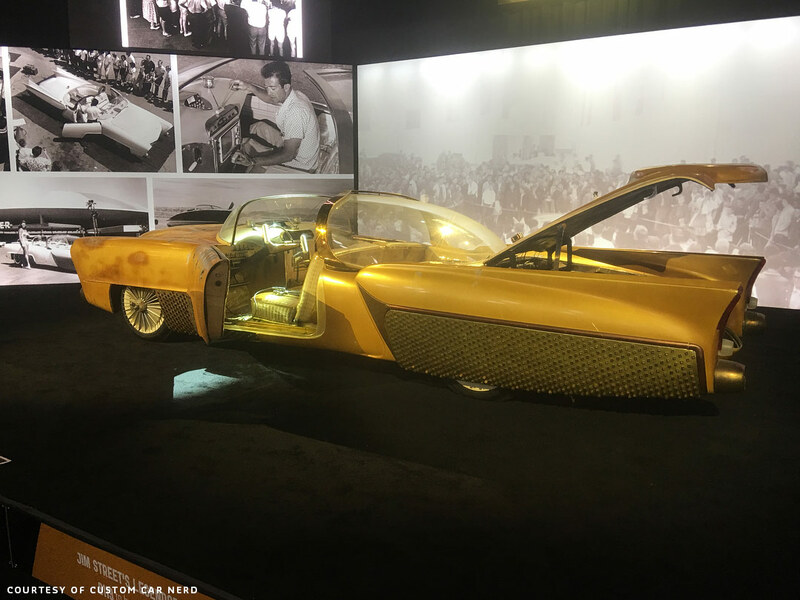 The Golden Sahara was sold for $350,000 ($385,000 including auction fees) to Larry Klairmont who was bidding on the phone. 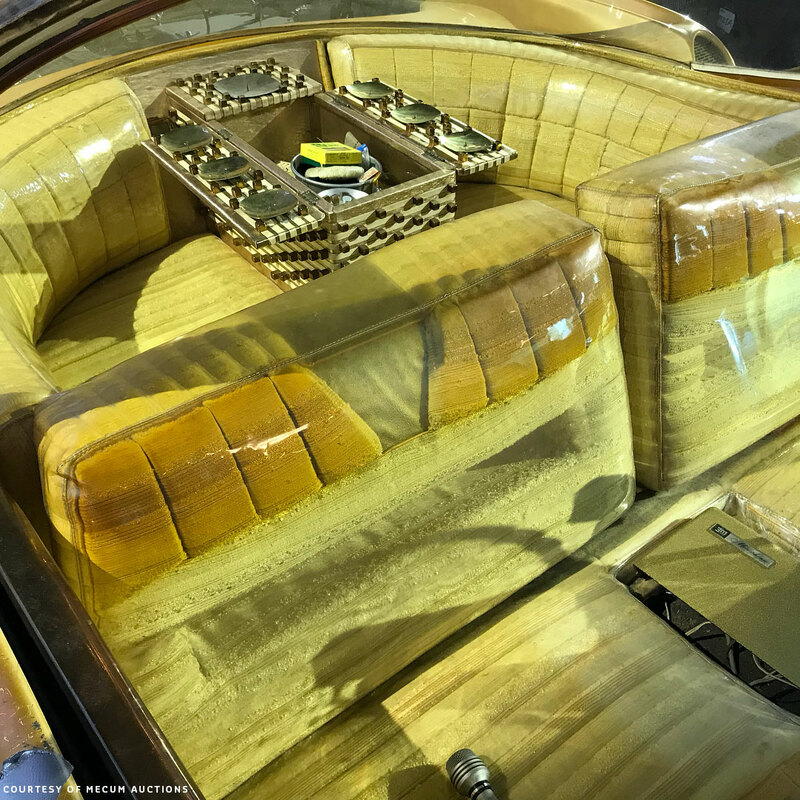 Larry Klairmont is the owner of the amazing Klairmont Kollection in Chicago, and the car will be either on display as it it for the public to see, or will be undergoing a full restoration first and then will be on display. This is fantastic news since then the Golden Sahara will be available for people to see at all time. 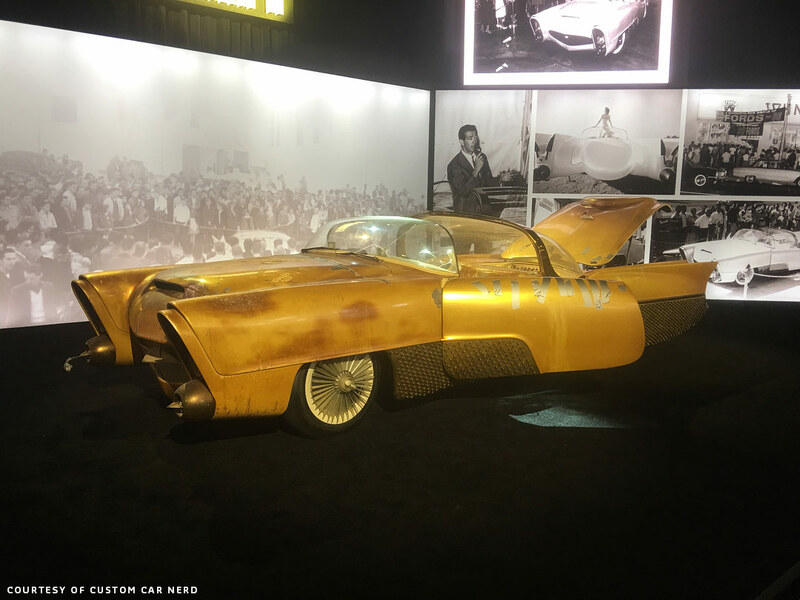 The kookie Kar, which sold for $440,000 was sold to somebody at the event, so the two cars will be separated. 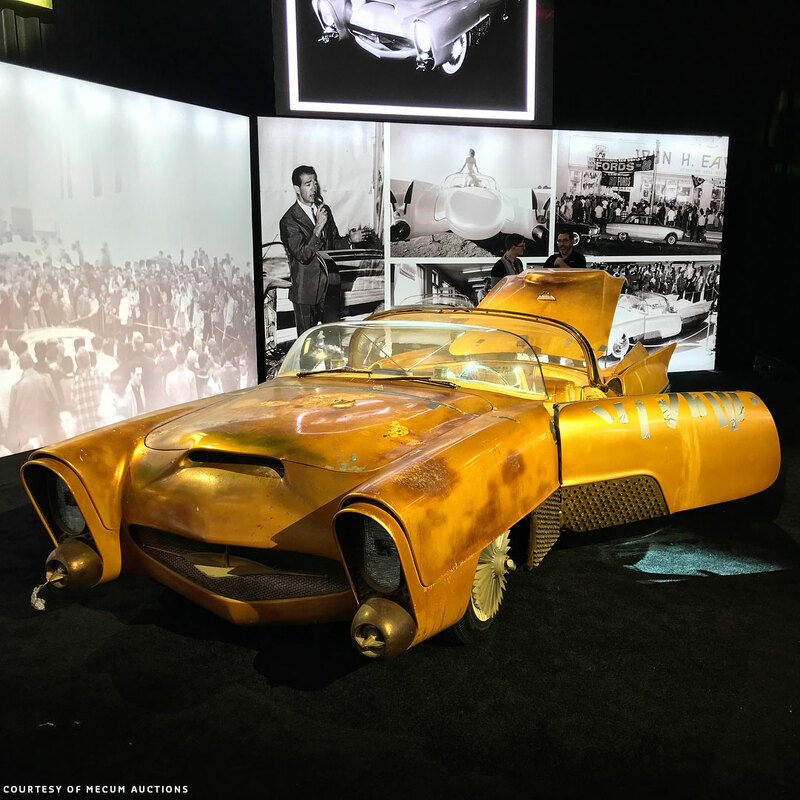 The Mecum Presentation Team has been working overtime with the Jim Street Estate Collection, and especially with the Golden Sahara. 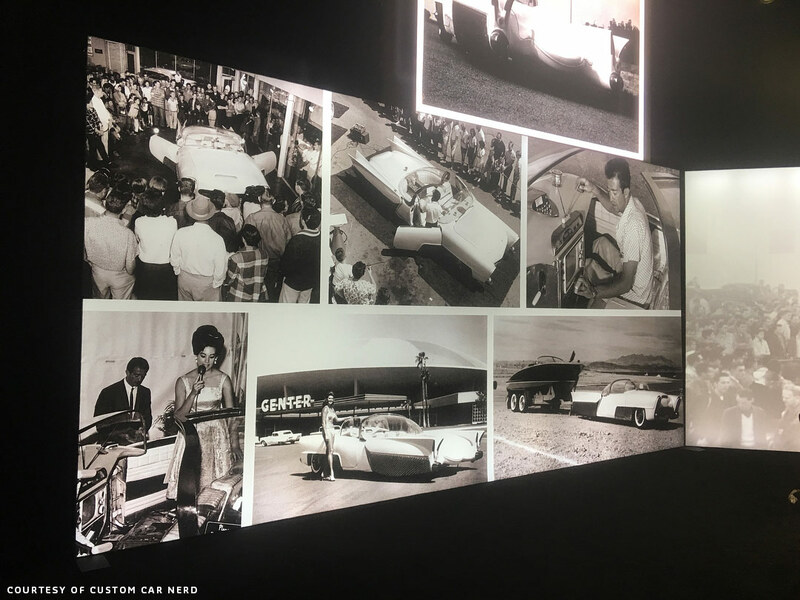 The Team created a special booklet with a lot of historic images of the Golden Sahara from Jim Street’s Peronal Collection including a brief story on the car’s history. 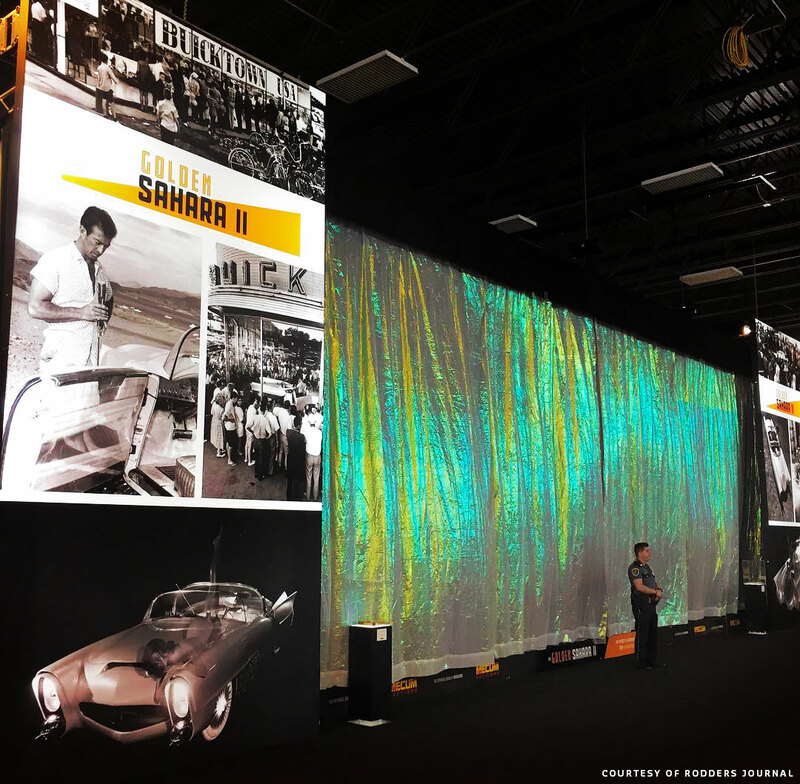 The Team also developed a really nicely made, huge display at the Indianapolis Mecum building were the Golden Sahara was unveiled to the publish for the first time on May 14, 2018. The Display consist of a nice selection of historic photos printed at huge formats. Hand made 3D signs and video displays. 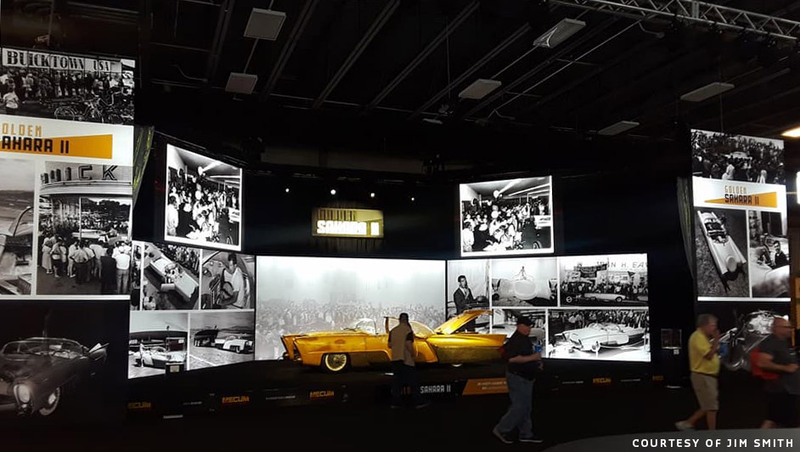 The unveiling at Mecum filmed by the Rodders Journal. 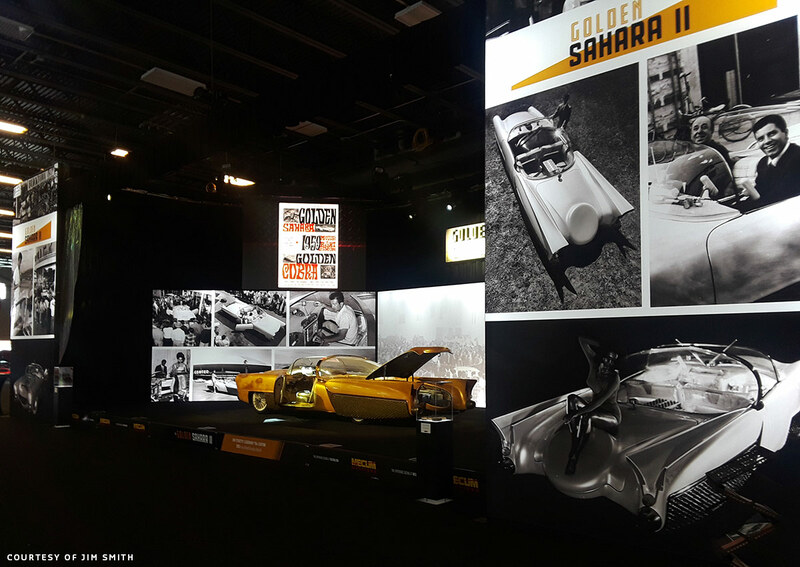 The Complete Golden Sahara Display. 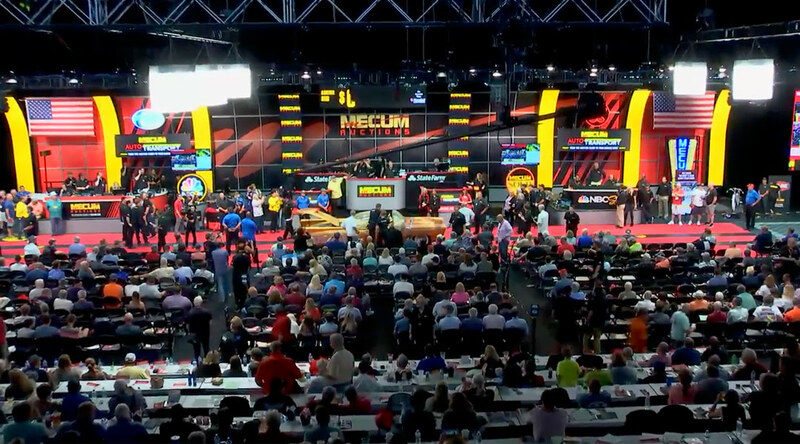 Quite spectacular work by the Mecum Presentation Team. Above the lower wall of static large images two large video screens showed a selection of historic images as well as some Historic video Footage. This was also the first time that the cars hubcaps were visible. The Bob Metz created units were removed when the original series of promotional photos were taken in March. 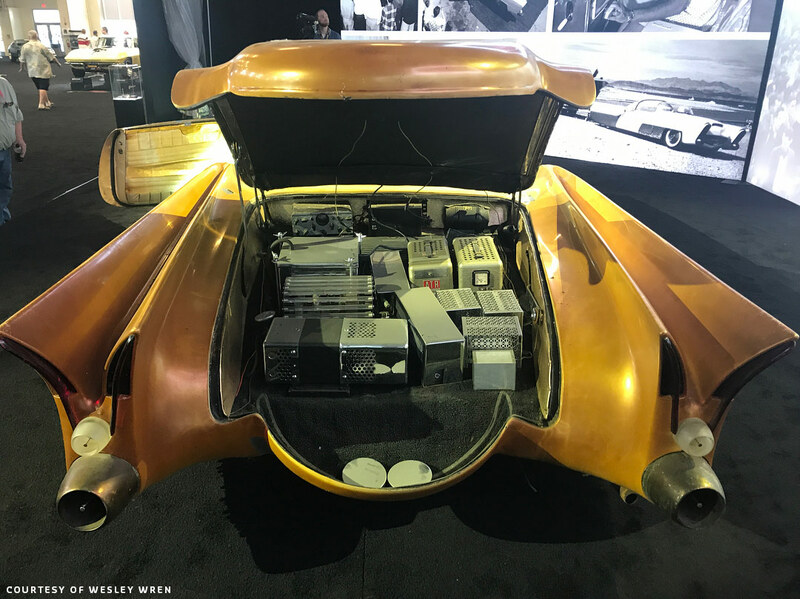 This was also the first time that the car was displayed with the trunk open. 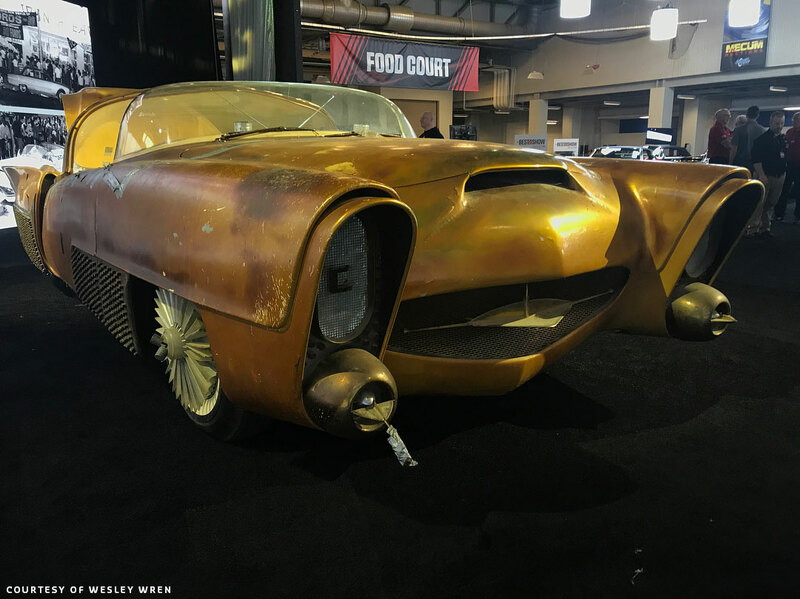 When the team at Mecum opened the trunk for the first time they could not believe hos good everything looked inside… after all these years. 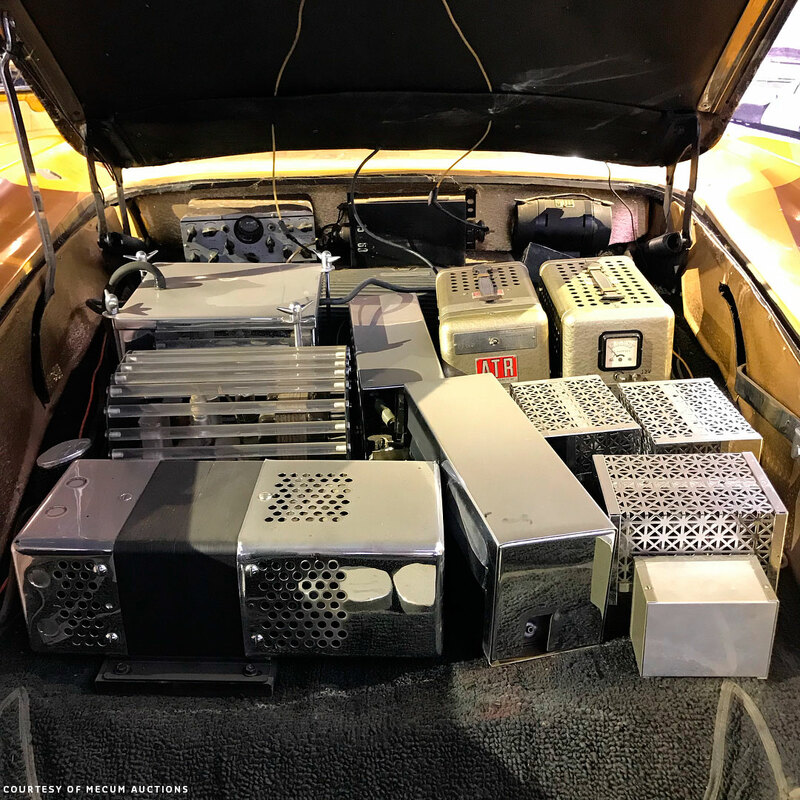 All the electronics in the truck that were needed to make all the special features on the Golden Sahara work. This will be fun to restore… ore perhaps it all is still working. We hope to hear about this in the near future. The Golden Sahara back on the podium where it spend so many years in the 50’s and 1960’s. In its natural element. 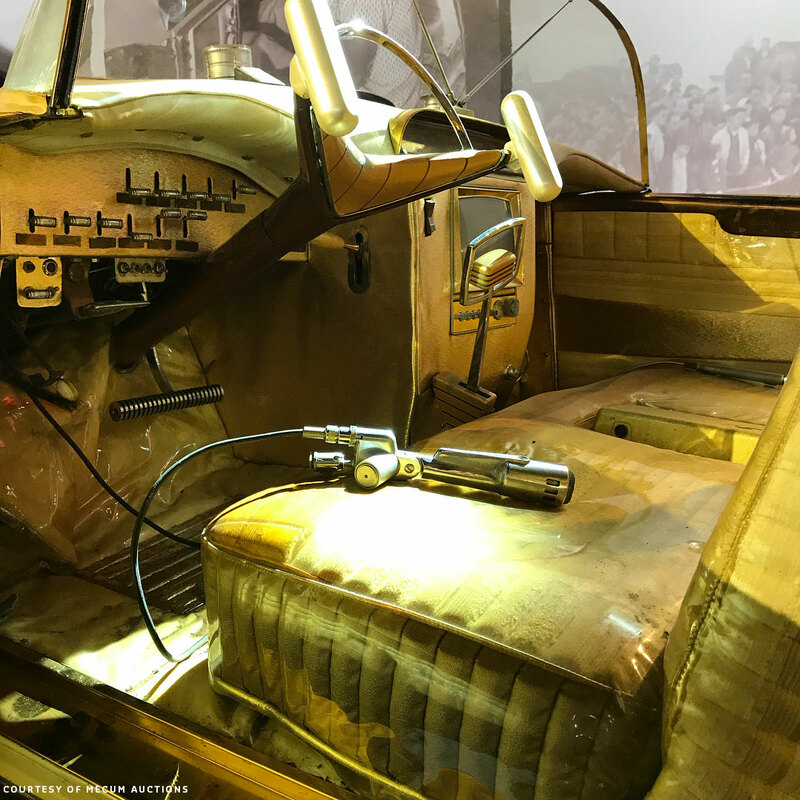 First time the audience could take a close up look at the interior. I wonder what the interior will look like if the plastic covers are removed. Opened refrigerator box in the back on the cocktail seat center section. 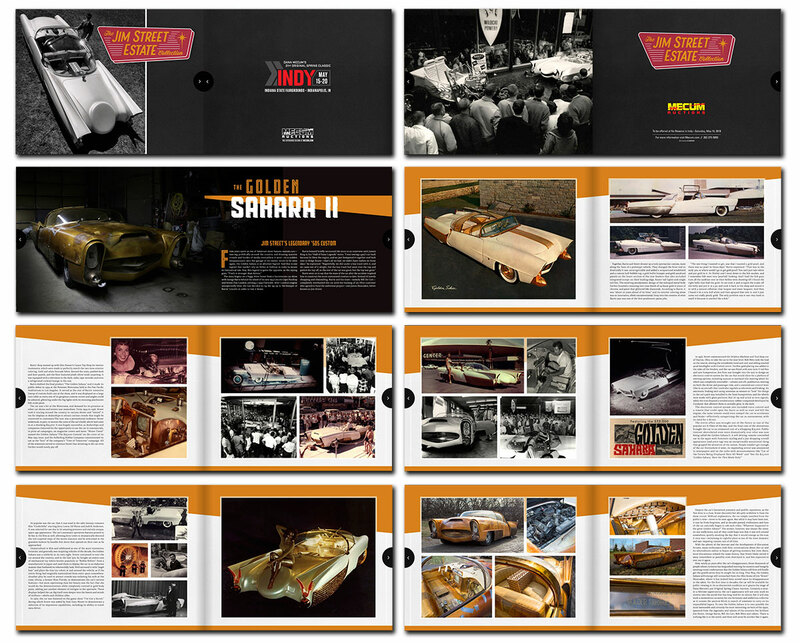 The Golden Sahara booklet created by the Mecum Presentation Team. 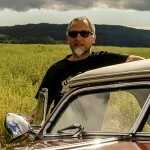 Looking forward to up dates on both the GSII and the Kookie car.